Christopher Williams, Manifesto, Concrete choral poem via loudspeaker choir, 2013. Image courtesy the artist. Christopher Williams is the recipient of the $10,000 Catapult Mentorship, in late April/early May 2019 he will be mentored by internationally renowned (and based) artist Johannes Sistermanns. Together they will spend dedicated time in Christopher’s personal studio to develop an understanding of the technical application of transducer technology in sound sculpture. Through critical exchange and sharing listening sessions Williams will build on his already strong knowledge and experience within his field of sound art to develop compositional approaches to the design of sound environments and soundscape installation. Catapult is presented with the support of the Ian Potter Foundation. Christopher and Johannes’ discussion will provide inspirational insight into the mechanics of a mentorship, their session will be followed by a ‘best practice’ session from Guildhouse, crucial for potential 2019 Catapult mentees and mentors. The evening will conclude with a showing of experimental responses from Christopher and Johannes. Christopher Williams is a sound artist working with radiophonics, soundscape, sound installations, and electro-acoustic music. He has lectured in Sound Art and Radio Feature-Making at the University of South Australia, and since 1990 has produced many radiophonic works for the Australian Broadcasting Corporation. He is currently a PhD candidate in Radiophonic Art at the University of Technology, Sydney. Christopher researched Contemporary Improvised Music at the University of Sydney; and studied Theatre and Drama at the University of New South Wales; and Directing at the National Insitute of Dramatic Art, the Australian Opera, and at the Australian Film and Television School. He has exhibited sound works at the Akademie der Kunste, Berlin; the Studio fur elektronsische Musik, Weimar; Future Space, Royal Institute of Australia; National Gallery of Victoria; Greenaway Art Gallery; Dianne Tanzer Gallery; Horsham Regional Art Gallery; Swan Hill Regional Art Gallery, Warrnambool Art Gallery; and Folly for a Flyover, London. He performed with his electro-acoustic trio at the Australasian Computer Music Conference and COMA. Christopher created sound for ‘Uneasily Along the Sand’ at Palimpsest No.8 and the sound installation ‘Manifesto’ for Palimpsest No.9. 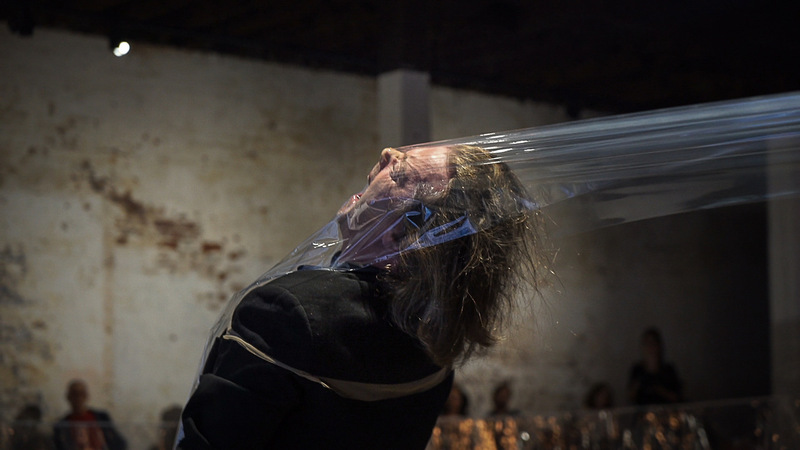 Johannes Sistermanns, New York sur _ / Fremantle, 5-channel composition, voice, accoridon, cling wrap, transducer, body resonance, 2015, 20:00. Photograph Brian Balan. Born in Cologne in 1955, studied piano (Klaus Runze), rhythm (H. Leiser) and composition/new music theater (M. Kagel) between 1976 and 1984. He lived in Varanasi in 1979 (studying North Indian singing at Banares Hindu University), obtained a PhD in musicology, lived in Paris from 1991-92 (where he met Luc Ferrari), in New York from 1995–96 (The Tao of Voice method with S. Cheng), in Japan in 2001, and in Australia. From 1997-2010 he was Vice-President of DEGEM (German Society for Electroacoustic Music). 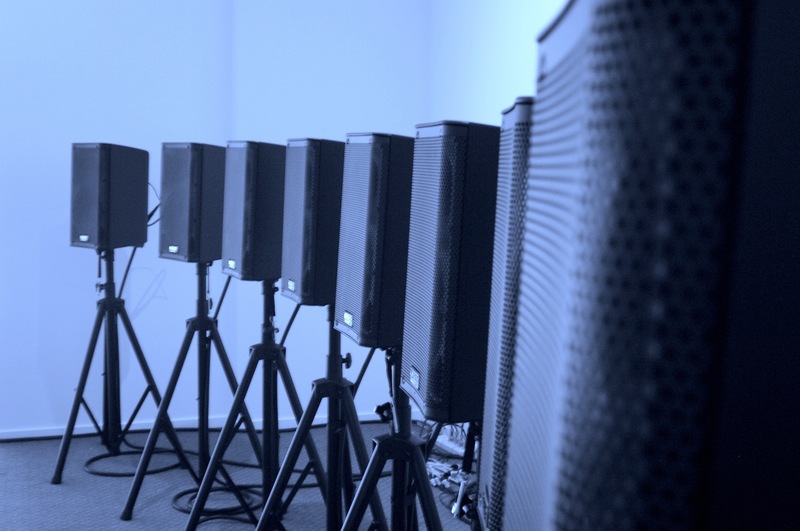 His work encompasses installative sound sculptures, audio plays and electroacoustic compositions for 2–8/43 loudspeakers (Sound Dome at ZKM, Karlsruhe) up to 2704 loudspeakers for wave field synthesis (TU Berlin), live satellite/Internet/ sound performance, graphic notation and instrumental compositions. Awards include the 1997 Karl Sczuka Advancement Award (SWR), 2008 German Sound Art Prize (WDR Cologne, Marl Sculpture Museum), 2015 Prix PRESQUE RIEN, Paris (Luc Ferrari) and first prize at the 2016 International Composition Competition “Leibniz Harmonien” 2016. Sistermanns operates from a space of potential. Boundaries based on the material properties of instruments or spaces are no longer constitutive here, but rather the informational power of the individual perceptual capacity.